I've got a product that needs a little bit of information captured when someone orders it. Is there any way to do that? Yes. If you shoot us through an email detailing your requirements (ie. the product in question and what you need to know), we can hook that up for you. Please decide if it truly is important to have that information as we don't want to have to do it for every product in your online shop. We wouldn't have time for building more awesome software. There are some Terms and Conditions associated with a product I want to sell. What can I do? When you add or edit a product in your shop, you can specify a 'Terms and Conditions' URL. If this is provided, shoppers will not be allowed to add this product to their shopping card unless they confirm that they have read and accept the terms and conditions listed at the URL. I want to get an email sent to me when somebody orders something from the shop. Can I do that? You certainly can. 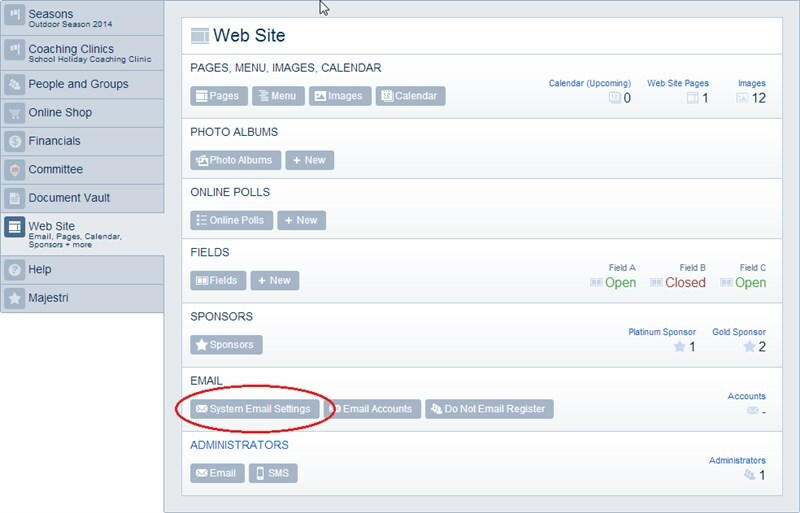 Go to the Web Site tab in the Control Room and click the button indicated below. The first field allows you to plug in a set of email addresses (comma-separated) that will receive notifications from the system when something important happens. At the moment, you will receive all system notifications to that email address, so you might need to show some techo chops and create a rule in your email client to only have "Order Processing" emails hit your Inbox.